Bubble Shooter is a great addictive arcade game for Linux combining simple rules with great wealth of combinations and various strategies. 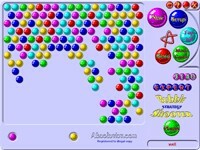 Bubble Shooter takes the best from Tetris, Lines, Pool adding new and cool features. This game is a part of the Bubble Golden Pack. If your shot fails to detonate any bubbles, you get a foul, and after you make a few such mistakes, a new line of bubbles appears at the top. The number of misfires allowed before bubbles will advance again changes from five to zero, then to back five and so on. It is shown in the bottom left corner by the number of bubbles; those bubbles lay in small dips - their number shows how many mistakes will be allowed next time. Various skill levels differ by the number of shots that you are allowed to fire without success. One more important rule: if you shoot out all the bubbles of some color, say red, no more red bubbles will appear on the board. This would ease things considerably. However, after that every time you use up your silver balls, *two* new lines will appear. Two colors out - three lines, and so forth. New lines will also pop out right after you shoot out a color. There can be no draw in this game, either you clean all the bubbles off, or they move all the way down on you. No compromise. Do not forget to send your best result to the online tournament - this is done from the TOP SCORES window. Be prepared that this game will keep you busy for quite a while.